Line two 15 cm cake tins with baking paper, spray with cooking oil or butter. Pre-heat oven to 170 C.
Put coffee, caster sugar, butter, cocoa and bi carb soda into a medium pot, heat and stir until just melted. Take off the heat and cool. Once cool enough, add the eggs straight into the pot and mix well. Add sifted flour and baking powder, stir well by hand with a whisk. Pour into two lined tins and bake for approximately 50 minutes, or until a skewer inserted into the middle comes out clean. Cool. Once cold, cut off the rounded tops and split the cakes in half, making four equal rounds. Beat the butter until very light and fluffy. Add vanilla and cream cheese, beat again until light. Add sifted sugar and then gradually the orange colouring until you get the colour you want. The icing should be fluffy and light. Boil raspberries, water and sugar until a syrup forms. Lay out the four rounds of cake and paint with syrup. Choose a flat one for the bottom and put onto a cake stand ready for decorating. Spread 3 Tbs of icing onto each cake layer, reserving at least two cups for finishing the outside. Chill until set (about 35 minutes). Finish the cake by spreading the remainder of orange icing onto the outside. Chill overnight, if possible. Put chopped chocolate, glucose and butter into a double boiler, or microwave and melt. Cool, the pour half onto the top of the cake and spread gently with a palette knife, letting a bit drip down the sides. The icing will set fast, so don’t take too long. 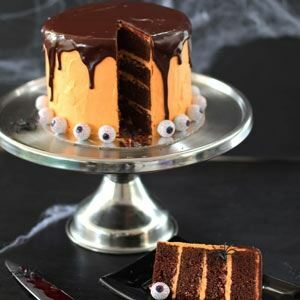 Decorate with other Halloween sweets, such as candy eyes.